Magnum Marine, the Miami-based manufacturer of high-performance yachts, will be launching its latest Pininfarina-designed creation, the Magnum 80', at the Miami Boat Show which opens today. Magnum Marine, the Miami-based manufacturer of the world’s finest high-performance yachts, will be launching its latest Pininfarina-designed creation at the 2008 Miami Boat Show. The fabulous new Magnum 80’, with its bold styling and unbelievable power and performance, will certainly be one of the show’s main attractions. The show opens today. The latest Magnum creation to be designed by Pininfarina, the Magnum 80’ is the company’s largest and fastest yacht to date. 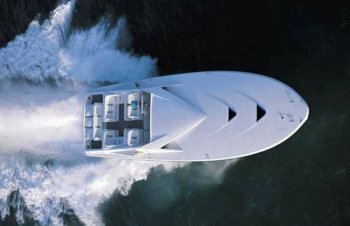 The 80-foot brute is equipped with twin 2400 HP MTU diesels coupled to race-bred Arneson surface drives that deliver a top speed of around 60 mph – truly remarkable for such a large craft. Even more impressive is Magnum’s legendary and unsurpassed ride quality. The deep-V hull cuts through the waves ensuring a smooth, comfortable and quiet ride even in adverse sea conditions. Tom Wolfe, the famous author, was recently aboard this new Magnum model. "I thought I was looking at the X-15 rocket plane,” he said. “The Magnum 80’ has that same look of ‘we'll crush you’ power that makes the question of beauty seem irrelevant. The difference is, the X-15 didn't have a sybaritic three-terrace open deck out back of the cockpit." At 80-feet long the interiors are very spacious and can accommodate up to four double cabins. Since Magnum Marine custom-designs the interiors for each client, layouts will vary in style and number of cabins. The owner of the Miami show model requested a minimalist interior mainly in teak, with large open spaces and only two VIP cabins; with the usual heads, living and dining areas and crew accommodations. Interiors were hand-built in Italy and installed by Magnum Marine. Also currently under construction at Magnum’s headquarters in ‘Thunder Alley’ is a new Magnum 70' designed by Italian architects, Lazzarini & Pickering and the eagerly-anticipated new Magnum 50'. Both models are under construction at the factory and will be ready to be launched this summer. 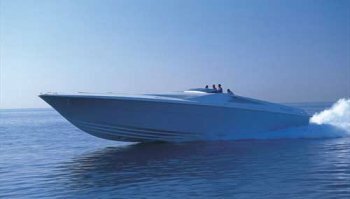 Magnum Marine in Miami, Florida, was founded in about 1966, when Don Aronow built two hulls specifically for the gut-busting offshore circuit. These two designs, with which he launched Magnum Marine, were the Magnum 27’ and the Magnum 35’; both went on to become World Offshore Champions in Open Class racing. To these two, very successful models he added a 16’ ski boat, the Marauder and a 16’ Catamaran, the Missile. Aronow sold Magnum Marine to Apeco in 1968. Apeco soon dropped the Missile and Marauder line, but instead, launched the Magnum 25’, 28’ and 38’. All the above models, are now called the Magnum Classics. In 1976 Magnum Marine was sold to Marchese Filippo Theodoli, an Italian boat builder, and his wife Katrin. This brought a major change in the product line. 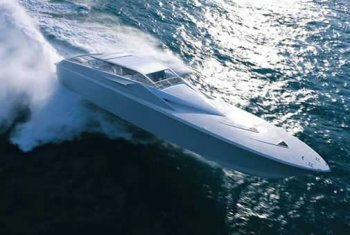 Filippo Theodoli had the innovative idea of applying high-performance technology to larger, more luxurious yachts. And thus, the first high-performance yachts were born. Yachts, that would reach the speeds of the race boats, but would have the comforts of the traditional yacht. The New Era Magnums.